London hobby robotics company and community leader RoboSavvy, in collaboration with GrabCAD, has launched a Humanoid Design Challenge. The contest gives you 40 days (and 40 nights) to design a humanoid robot that is both highly functional and looks great, while keeping the cost under $1000. The winner will receive their custom-built robot plus $800 in cash. Second and third place winners receive smaller cash prizes. Design guidelines specify some ambitious functional requirements: hands able to grasp, a head capable of both pan and tilt, and a waist permitting the robot to crawl, for example. To keep the cost down, certain constraints are given: the internal skeleton must be made of bent aluminum sheet, and the required outer shell must be made of vacuum-formed polycarbonate. The main actuators must be Robotis AX-12 and AX-18 servos, which make the cost challenge difficult right off the bat — these typically cost $45 and $95 each, which comes to somewhere between $700 and $1500 depending on how many of each you use. Smaller hobby servos are also allowed for areas where strength isn’t needed (such as the neck and hands, perhaps). 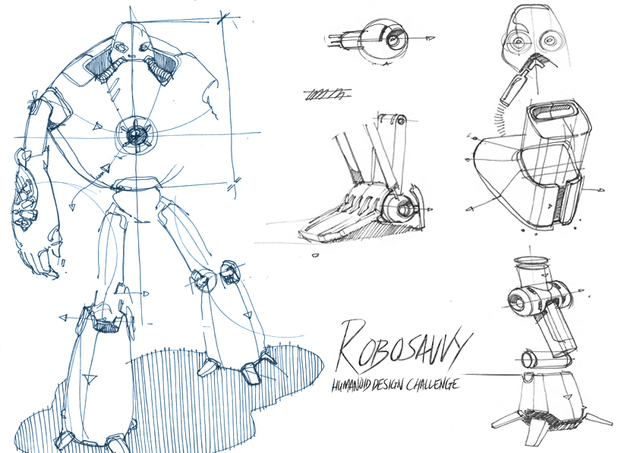 The RoboSavvy team, who are experienced humanoid robot builders, will tweak the winning design as necessary to make it functional as envisioned. They recognize that not every contestant will be experienced in humanoid robotics, and may not be able to judge which servo is needed in which joint, for example. It is also not necessary to specify the electronics in any detail, though the design must leave room for a battery pack and a Raspberry Pi or BeagleBone Black main controller. Like an X-Prize, this challenge stretches the boundaries of what is possible. But whether the final result meets all the goals, or just some of them, there are sure to be many interesting ideas and cool designs that come out of it. Hats off to RoboSavvy and GrabCAD for sponsoring the contest, and good look to all participants!